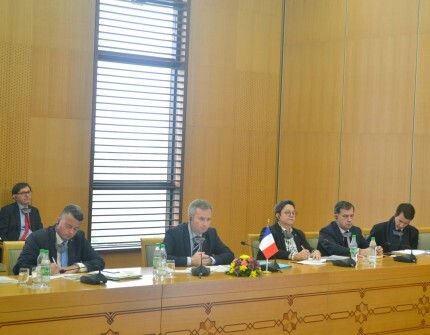 On the 15th of April 2019, Turkmen-French political consultations were held in the Ministry of Foreign Affairs of Turkmenistan. The Turkmen side was led by the Deputy Chairman of the Cabinet of Ministers of Turkmenistan, Minister of Foreign Affairs R.Meredov. The French delegation was headed by the State Secretary of the Ministry of Europe and Foreign Affairs of the French Republic Jean-Baptiste Lemoyne, who has arrived to Turkmenistan on a working visit. In the beginning of the meeting, the parties expressed mutual greetings and noted the significance of the current session from the perspective of developing multilateral cooperation between Turkmenistan and France. During the negotiations, the participants discussed a wide scope of issues related to the intensification of political cooperation, regional issues including Afghanistan, as well as strengthening of intergovernmental and inter-parliamentary ties. The positive collaboration between Turkmenistan and France in the framework of international organizations, particularly the UN, EU and OSCE was noted. Special attention was devoted to the development of trade-economic relations, including the issues for their future development. Also, the success of multiyear cooperation in the sphere of culture, education, and science, as well as the health protection was noted. During the meeting, the parties also reiterated the importance of the Intergovernmental Turkmen-French Commission on Economic Cooperation. It is worthwhile to note that today, the third session of this commission will be held with the participation of the heads of the ministries and agencies of Turkmenistan, as well as the representatives of the business circles of France.